Travelers come to Belize for countless reasons, just some of which include the verdant jungles, the stunning beaches, the warm climate and the laid-back lifestyle. However, you don't want to forget about the incredible tours that offer you a glimpse into the heritage and terrain of this incredible Central American country. If you're up for some serious adventure and an unforgettable day, combine the rich history of Xunantunich with the adrenaline and beauty of the Barton Creek Cave. If you're staying at the Grand Baymen on Ambergris Caye, the adventurous day will begin by heading to the mainland by ferry or even by plane, which takes just 20 minutes from takeoff to landing. Most tours officially begin by driving to the scenic Caye District via the Western Highway. Xunantunich is less than two miles from the border with Guatemala, and the scenery along the drive is truly breathtaking and a far cry from the urban landscape of nearby Belize City, the country's capital. Before you can enter Xunantunich, you'll have to climb aboard a 19th century ferry that stills gets cranked by hand in order to cross the Mopan River and reach the ruins. In the Mayan language, Xunantunich means Stone Woman, a reference to the local belief that the ghost of the woman inhabits the historic site. Visitors will come alive with wonder when they get a glimpse at the Mayan ruins that are well over 1,000 years old. The largest of the temples still standing at Xunantunich is called El Castillo, and you can climb right to the top of it and soak in views of the surrounding landscape. After El Castillo, the most significant remaining structure in the ruins is called Structure A-1. Although unnamed, this building is dated to the ninth century and was the ritual space for the most important elders and religious figures in the Mayan civilization. 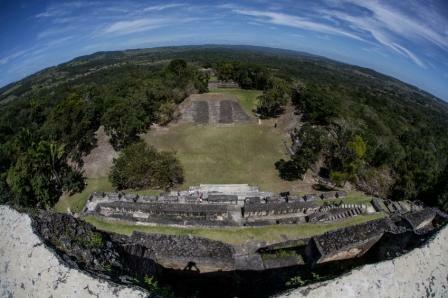 Many all-day tours stop at the town of San Ignacio after touring Xunantunich. On Saturdays, when San Ignacio has a bustling market, the small town comes alive and shows that it is a vibrant hub of socializing and commerce in the Caye District. On other days, the town is quiet and beautiful, making it the perfect stop for a quick lunch made up of authentic traditional Belizean cuisine. Rounding out this day of unparalleled fun is the chance to explore Barton Creek Cave Reserve. Archeologists have found pottery and other physical evidence that the cave was important to locals as early as the 3rd century AD. While the history of this landmark is impressive, visitors most love the fact that they can canoe right through the cave system. Wear a headlight and climb into a canoe, and get excited for the opportunity to admire the glittering cave from the inside like few people in the world will ever have the chance to do. For a whirlwind day of fun, history and adventure, tour Xuanantunich and the Barton Creek Cave. Learn more about all of the amazing things to do in Belize.